No it's Super Pyjama Boy. 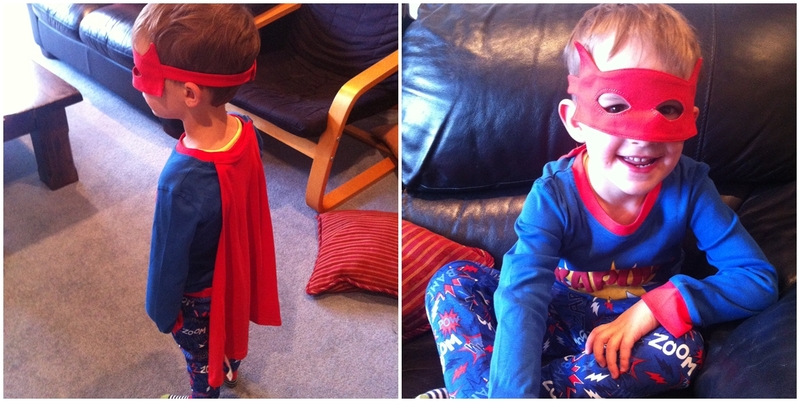 Loving this cute pyjama set complete with mask and cape sent by Grandma & Grandad from the UK for Mylo's birthday. He looks like such a skinny minny with the tight fitting pants though, it makes me giggle to see him zooming round the house in it! Loving that last week at New World as I was putting my groceries on the conveyor belt, a New World employee came by and asked if I'd like some help packing the groceries in the car. I would normally have been likely to answer 'thanks, but I'm fine' but really what would have been stopping me from saying yes? Pride maybe? Let's face it, it was late on a Friday afternoon after a long week of work, I was tired and so were the boys, and his earnestness and sincerity really spoke to me. We make small talk on the way out to the car about the sunny day and the forecast for the weekend, and whilst I buckled the kids into the car, he packed my groceries away for me. I thanked him for the help, and asked his name, it was Zane. We shook hands, he went his way and I went mine. But I left that carpark with the biggest smile on my face and a gleam in my heart, faith restored for today in the goodness of man. And when I got home that night, I made a point of emailing New World to say what a wonderful experience it had been. Tomorrow night I'm off to WOW (World of Wearable Arts) with my mum. Can't wait. I had such a great time last year when I got shouted by a supplier, that I knew I just HAD to take my lovely mum so she could experience it too. I decided that after managing to coat an entire load of washing in tissues that I am going to make my millions inventing either a) a washing machine that beeps a warning as an item of clothing gets put into it that contains a tissue or b) a tissue that doesn't disintegrate in the wash! The countdown is on. 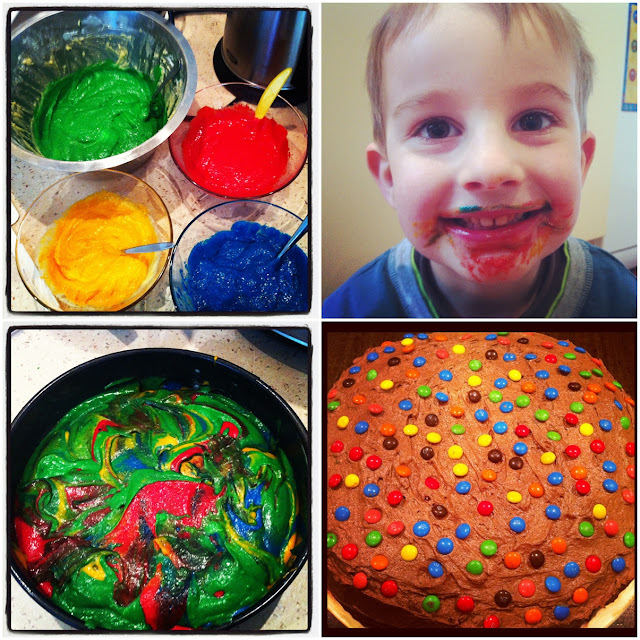 In 48 hours our house is going to be transformed into one big craze of colour for lil mister's party. All going well, I'm hoping the lounge might end up looking a little something like this. Oh and I'm attempting a rainbow layer cake..eek...wish me luck! Last week I did a trial run and made a marbled version for Mylo's daycare celebration to test the depth of the gel colours out. It was heaps of fun and the kids at daycare loved it. As did my bowl lickers at home! It was real cute seeing Mr. Bashful in the Happy Birthday hot seat at daycare telling everyone how old he was and choosing some songs to sing while they waited the cake to be cut. Hi everyone, due to a slight technical glitch the linky list wasn't working...but should be now...come and link up!!! 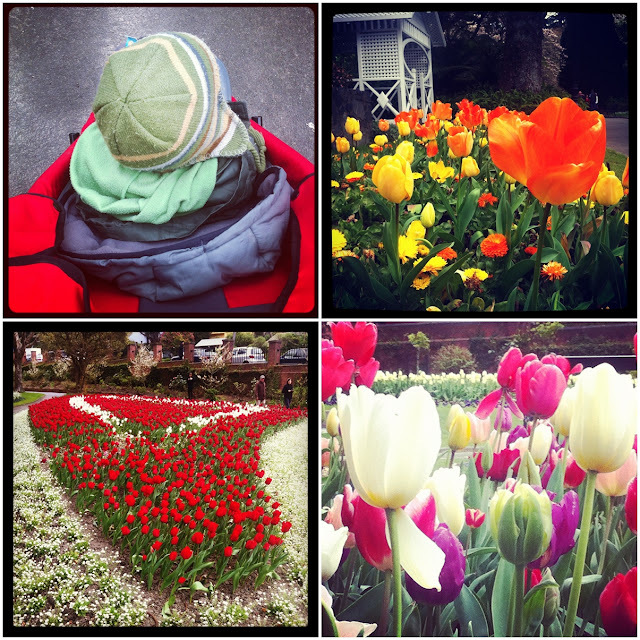 Nothing says Spring to me like row upon row of tulips. Their bright faces upturned reaching towards the light, towards the warmth. The fact that such beauty springs from the plainest of bulb roots, hidden deep within the earth over the coldest months never ceases to amaze me. We plant these bulbs in anticipation of what we hope they will become, yet never knowing if they will choose to be brave and poke their head through the soil, to choose the life less ordinary. And yet here they are. Hundreds upon hundreds. Blooming every year. Each flower a success story in its own right. Each beautiful petal formed lovingly inside the shelter of the bud. And me? How was I formed? 'You made all the delicate, inner parts of my body and knit me together in my mother's womb. I praise you because I am fearfully and wonderfully made. Your workmanship is marvelous, how well I know it. You watched me as I was being formed in utter seclusion, as I was woven together in the dark of the womb. You saw me before I was born. Every day of my life was recorded in your book. Every moment was laid out before a single day had passed. These look like they should be naughty, but so aren't. They are gluten free, dairy free, sugar free and egg free so pretty much suitable for anyone, anywhere no matter your diet. They taste just like carrot cake. True story. 1. Put almonds in the food process and blend until a fine flour. Remove. 2. Put dates and coconut in food process and blend until a smooth paste is formed. 3. Return nuts, and add carrots and spices, mix well. 4. Add coconut milk/oil and blend until desired consistency is reached. I love this time of the year. Mylo and I took a walk down to the botanical gardens last weekend, as I didn't want to miss out on the spring bloom. It's so beautiful, but delicate too and so you always run the risk that a Wellington spring gale will blow through and destroy them, so we thought we'd better make hay while the sun shone (figuratively speaking, as it was actually coming onto rain while we whizzed round taking a few pics). I know I'm a bit behind the times, but I've only just recently discovered the music of The Fray. Last week I downloaded the album How to save a life and I'm enjoying blasting it out on my iPod or on the stereo at every opportunity. And that download was followed hot on the heels by the new Alanis album which I'm totally digging. Not just digging in fact, I'd call it all out love. Especially this song, The Guardian. . If you were paying attention if you watched the little Happy Birthday slideshow I put together for Mylo yesterday, you'll notice that The Fray's song Look After You was the soundtrack for the first half and The Guardian was the soundtrack for the second half. I'm kinda hooked on these two songs, did ya notice?! He's finally done it. Hubby has finally joined the skinny jean brigade. I thought he looked so dishy that I made him pose (somewhat reluctantly) for a pic. Last Friday was monster dress up day for Noah's class. 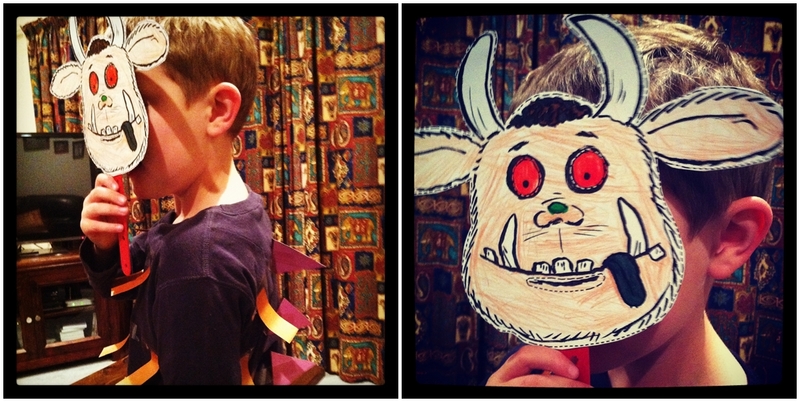 So we racked our brains and came up with The Gruffalo. I found a template for a face mask and then we cut out some card and sellotaped it on to a t-shirt to make the gruffalo's prickles and fur. Not bad for 20 minutes effort we thought. We currently have this sweet deal going where every few months we get to go and do a mystery dine at Wagamama. We get paid up to a certain amount (which usually covers a starter, mains and drinks for us all), and we then have to write up a detailed report on the food, service etc afterwards and send it in. 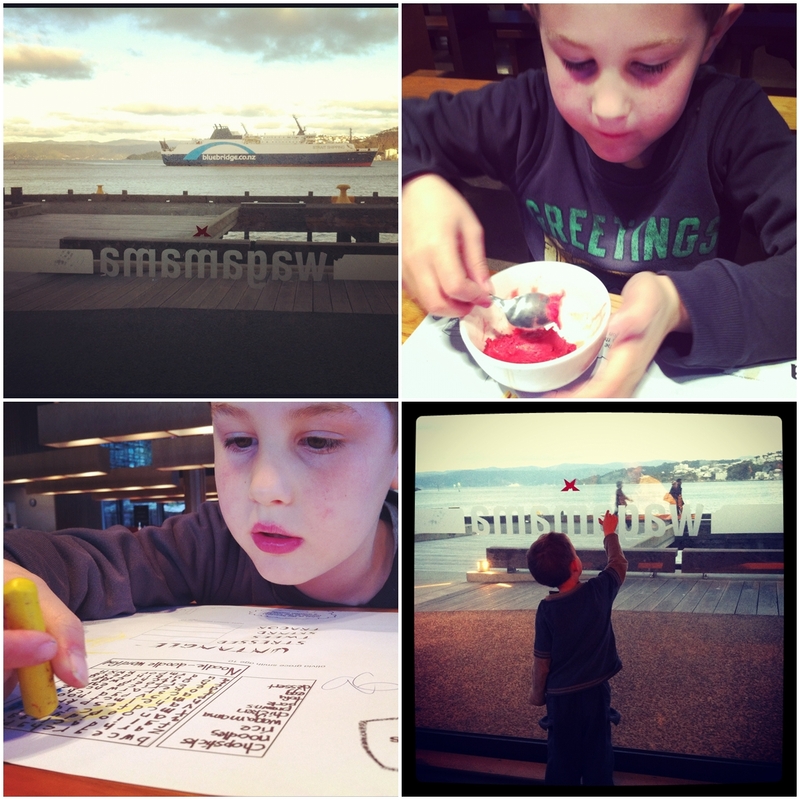 We went out last week for an early family dinner for our mystery dine. It's the 3rd time we've taken the boys and I am pleasantly surprised that they are definitely getting better with the different flavours of the food there over time. Loved the early evening views of the waterfront from our little pozzie at the front of the restaurant. Loved the yummy food and also how well they cater for kids (and for gluten-free bods like me right now). And that my friends was our week! I'd like someone to please tell me where the last year has gone! It feels like no time at all has passed since our little buddy turned 2. I have fond interesting memories of Mark and I attempting to build a trampoline the afternoon before his little Moon themed birthday party, and how tricky that turned out to be. Fast forward a year on, and we have grown more in love with this mischievous and independent wee sausage whose many facial expressions and hilarious Mylo-isms never fail to entertain us. True to past form, I've put together a wee slideshow of our favourite Mylo moments of the past year. This is YOUR life kiddo..the adventures of Mylo age 2-3 from mnms on Vimeo. And if you don't make it through the video, here are some favourite shots from the past year. You are a ray of sunshine, a pickle-licious morsel, a joker, a mood changer. You prefer fruit over chocolate which never ceases to amaze us, and kick a ball like a kid way older than three. You are quite happy to play independently for long stretches of time, and are comfortable in your own company, but you are equally happy having a blast hanging out with your wonderful big brother. You still absolutely love cuddles, and give the loveliest, sloppy kisses. You Mylo, are a precious gift from God.